I just love the teeways. They are starting to look fantastic now that the overseeding is coming in and we have them "beefed up" on nitrogen. They're looking so good in fact that I think I will lower the mowing height on them one more time this year. To try and explain how much they have increased our efficiency will take several blogs. First of all mowing them is extremely fast. It takes about 4 hours to mow them using the Jacobsen 1880 which is the perfect machine for the job. The same area that the teeways include would normally take about 16 hours to mow since it would have required 3 people walk mowing square tees and dew strips, and then another person mowing the rough around and between the tees. That's an amazing increase in efficiency, and they look really neat. But remember this is only the beginning. Next year, the teeways shapes will be finalized so the mowing lines will be much improved, and they will look even better. During the round I took some pictures of a few of them to show you that we are making some big changes to several of them when the master plan is implemented. Below is a quick look at some those teeways. According to the master plan, this hole gets lengthened about 20 yards. When that happens, trees will need to be removed and I believe the cart path will no longer be needed. Can't wait for that project. I think the 10 green 11 tee complex is in dire need of this upgrade. This is the largest teeway we have as it is just under 1 acre in size. Right now it is one of our best looking ones and definitely one of my favorites because it is just so big. The plan is that it will even get bigger once the hole gets lengthened another 15 yards. Then our finishing hole will be about 535 yards...........not super long but respectable. The teeway on #9 is really the best looking because it is the only one without scalped ryegrass. This winter it will be reshaped as will most of them as we take fairway sod from them in order to create the run-offs and run-ons around the greens. According to the plan, this hole also gets lengthened and many trees will be removed on the left allowing for plentiful sunlight and the possible removal of another cart path. The teeway on #6 is awesome because of the way it steps down to the white tee. According to the plan, the mass planting on the right will be removed. This will allow for the blue teeing areas of #6 and #18 to be connected as one surface. Once the tree removal process is complete on the 9th tee, I see there being adequate air and light to remove the path you see here on the left of the tee. 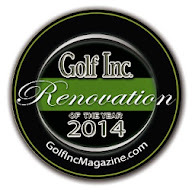 BEST RENOVATION IN THE U.S.
Clubhouse 1910-1961 "The Grand Old Lady"